Being an eminent organization, we hold expertise in an exclusive range offering Single Compression Cable Glands. These are sourced from Sterling, who make use of optimum quality raw materials to manufacture cable glands. 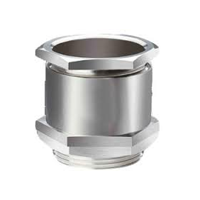 To cater the varied requirements of our customers, we offer customization on single compression cable glands. These are used widely in Households and various Industrial or Commercial Sectors. We make our range of cable glands available to the customers at the industry leading prices.